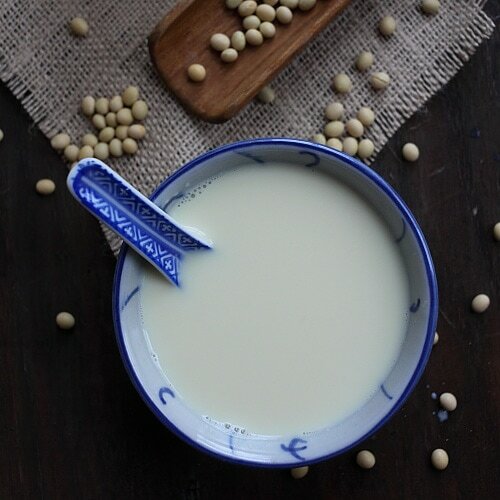 How to make soy bean milk at home? Learn the easy step-by-step guide for a healthy and refreshing soy milk. Soy milk has been gaining popularity in the United States due to its many health benefits. Nowadays, you can get soy milk at any regular grocery stores or Asian food stores. However, mass-produced soy milk are mostly made with non-organic and GMO (genetically modified) soybeans, and preservatives are added. The good news is I will be showing you the step-by-step, so everyone can enjoy the purest soy milk made with organic and non-GMO soybeans. Now a little history about soy milk. Soy milk, or soybean milk (豆浆 doujiang) is a traditional staple in Asia, especially in China, Taiwan, Hong Kong, Malaysia and Singapore. The Chinese invented soy milk thousands of years ago, and from soy milk, they also created tofu and tofu skin. Soymilk is very versatile and can be served sweet or salty. In China and Taiwan, soy milk with fried Chinese crullers or youtiao (pictured above) is a staple breakfast for many people. To make soy milk, you need only two key ingredients: soybeans and water. A good blender is always handy to blend the soybeans. I used the Blendtec Designer Series Wildside and the blending of the soybeans was a breeze. Three seconds and a big batch of soybeans and water were finely blended. You can find organic and non-GMO soybeans online or at stores such as Whole Foods. Some Asian grocery stores also carry them. Please take note that organic soybean doesn’t mean that they are non-GMO, so make sure you read the label and packaging well. 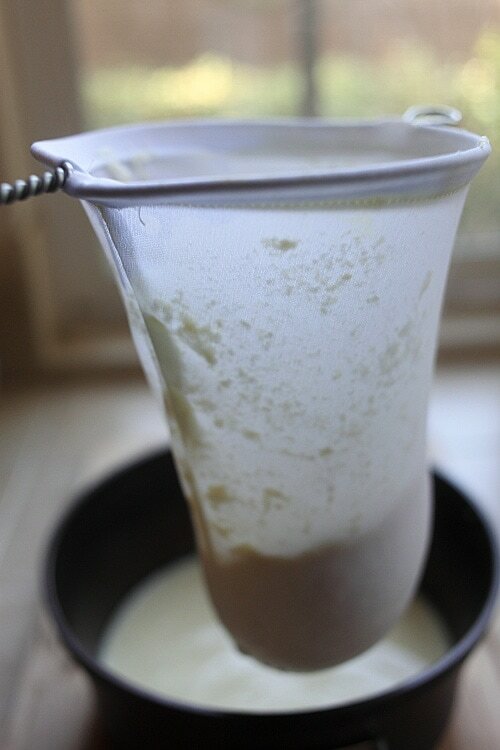 Making soy milk is rewarding as homemade soy milk is richer in taste, with a pleasant soy aroma. It keeps well in the fridge for a few days, so making a big batch is definitely the way to go! Now the good news: I am giving away a Blendtec Designer Series Wildside with Twister Jar (retail value: $620) to a lucky reader of Rasa Malaysia. Rinse the soybeans thoroughly with water and soak them overnight with water. The next day, discard the water and rinse the soybeans a few times. Remove the soybean skins as much as you can. Drain and set aside. 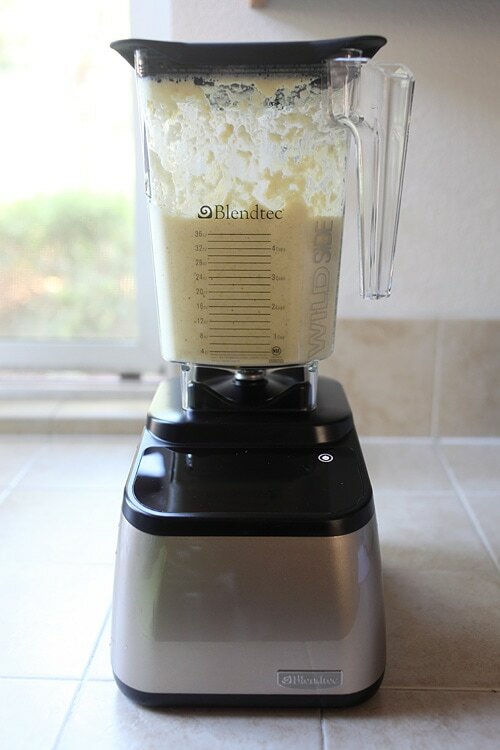 In a blender, add the soy beans (in batches). Add some water to the soybeans and blend well. Transfer the blended soybeans and water into a big 8-quart stock pot. Repeat the same until all soybeans are blended. Turn off the heat once the soy milk is done. Use a cheese cloth or paper or cloth coffee filter (you can get it on Amazon) to filter out the soybean residue. Squeeze the residue and make sure that all soy milk is fully extracted. Discard the residue. Add sugar to taste before serving the soy milk. If you like fried youtiao or Chinese crullers, you can dip it into the soy milk or cut them into pieces and dunk them into the soy milk. It's delicious and a great breakfast. There are many ways to make soy milk. Some people blend the soybeans and then filter out the blended soybeans before boiling the juice. I prefer my method because boiling the blended soybeans releases the soy aroma. The soy milk is also richer in taste. Reminds me that I need to cook my beans soon..
Good idea, I never know that the residue can be used for cooking. Can you share a recipe of 豆腐花 dou fu fa? Why do we have to remove the skins? Can we dont in order to make life easier? :) Also, I have tried almond bean curd before, do you think by adding almond essence, we can make almond-flavoured soya bean drink? Should taste ok? The skin will come off by themselves after soaking overnight and they should float on top of the water, just discard those as much as you can. If you can’t, it’s fine. You can try the almond extract I have never tried it before. what is the purpose of removing the skins? Also, why add almond extract when you can add fresh almonds to the cooking process? I made my first batch of soy milk last yesterday and added equal parts almonds and soybeans, turned out quite delicious. Again, I haven’t found a reason to remove the skins, it was pretty laborious. As for cooking the beans, I’ve cooked many types of dried beans before, I’ve never soaked them overnight, I do use the “quick soak” method, boil the beans for 3 minuts. let cool, rinse the beans, then add appropriate water to pat, add beans, bring to boil and simmer for about 1 hour, then process the beans into milk. you can do in a morning or afternoon time and as far as I can tell, it is still a wonderful drink. Sometime, I’ll add papaya chunks or a little pomegranate juice that is freshly juices. I’m even going to take it to another level and try using coconut water instead of plain water for extra boost. Where can I get organic soybean? Whole Foods or online. The link is in the post. So cool. Where can we buy a cloth strainer like that? Where can I purchase organic and non-GMO soybeans? Whole Foods should have it or you can buy online. The link is on the post. You can find it at 99 Ranch Market or other asian supermarket. I have bought organic soybeans from Whole Foods. But, the beans are too old. It can’t sprout. I like your cloth coffee strainer. It reminds me of most kopitiam in my hometown =) Where can I buy it? So to clarify, the whole 7 quarts of water listed in the ingredients list is what you used to blend the beans with, and then later boil the mixture, without adding more water? Thanks for the recipe! Yes, all 7 quart of water, including the water used to blend the beans. I got to know you from Steamy Kitchen,Jaden Hair. But, this is the first time I write to you. Two years ago, I already started reading your webside, using your recipes cook for my family and sharing with many friends. I have your cook book Easy Chinese Recipes. We all love your recipes so much. I use a lot of chinese new year recipes from yours. Here, I just want to say Thank you so much for posting all the delicious recipes for us. I will share your newsletter with my friends who love cooking like me. Good Luck! Laura soy beans are all natural, non-GMO, but not organic. Does any body know a better way to remove the skin from the soy beans? It’s time consuming when I have to squeeze every single bean with my fingers. Rub the soy beans with both hands help to loosen the skin off. I finally tried this this morning….SO yum! Thank you!! In the past, I’ve been trying…too hard. Measuring ingredients by weight and volume, timing everything perfectly. This recipe is a lot more creative, and lets me use my own judgement. Thank you!! Just wondering if i could add some cocoa to this recipe? Because i like chocolate milk better then reg soy milk maybe even vanilla? My family likes to make a kind of savory pancake with the soy residue! Mix in a little bit of flour, egg, salt and scallions and fry them up like pancakes! Serve with some chili sauce. Do you add any liquid to the batter? This sounds like Korean savory pancakes, except we add water (I sometimes use milk), and I’ve never used the soybean residue before. Sounds good, and would make a complete protein when combined with the wheat flour! Hi, I have made the mistake of boiling my soybeans first. Can I rescue the milk somehow, any suggestions? Just make the milk as usual. Dr. Ben Kim recommends cooking the beans first for 15 minutes. This gets rid of the trypsin and retains the nutrition. Then blend with water, strain, drink. 1) Soak the beans 12 hours. Change the water once or twice if possible/convenient. 2) After soaking, handle beans carefully because any injury to the beans releases the LOX group of enzymes that is responsible for creating the “beany” flavor which is actually due to free radicals formed by the enzymes. Toss out the soak water. 3) Boil the whole beans in a 10:1 water:bean ratio by weight for no more than 10 minutes. This will inactivate the LOX enzymes. Scoop the scum off the top of the water. 4) Pour the beans and water into a sturdy blender and blend on high for at least a minute. 5) Pour contents of blender into a pot and boil for at least 20-30 minutes. This will further inactivate/destroy anti-nutrients such as trypsin inhibitor. 6) Strain through multiple layers of cheesecloth into an airtight, sealed glass container and either drink immediately or refrigerate. 7) Soymilk should keep for about 1 week. Maybe up to two weeks. An alternative method that may save time and be even more effective would be to drop dry soybeans directly into boiling water for 10 minutes, scoop off the scum, drain in a colander/sieve, and then soak for 12 hours. After soaking, blend the beans and make the soymilk as described above. Nonsense. Dr. Kim recommends boiling the bens first for 15 minutes only to get rid of the trypsin and retain the nutritional value. Abusing your beans does not make a difference. Boiling them will remove the unwanted enzyme. I went to the website you linked and the steps you included here are nowhere to be found. And, beans are only soaked for 6 hours at the most. Depending on the climate soaking can take less time. The article states use a ratio of 1 part beans to 5 parts water. The article does not state to baby the beans. If you simply boil the beans for 15 minutes, that will take care of the trypsin according to Dr. Kim and retain the nutrition and rids most of the beany taste. The extra step of boiling the beans and then the milk is not necessary and is not mentioned in the article. If you do this there is more opportunity to lose nutrition. The article does say to boil the beans 20 to 30 minutes, however. Boil the soaked skinned beans, blend them, strain and drink. It is that easy. Running the bean/water mixture through a strainer is slow because the filter/strainer clogs up, so I tried a different method. First I turned the dry beans into flour in my Vitamix blender, then removed the flour, and added water to the blender. With the blender on low, I added the flour back to the blender and ran it up to high for several minutes. Meanwhile, I boiled the rest of the water in a large pot, then added the soy/water blend, and returned the mixture to a boil, stirring occasionally. After boiling, I let the mixture cool in the pot for 30 minutes. Then I carefully removed the milk with a cup while leaving the soy residue on the bottom of the pot. When I reached the soy residue on the bottom, I put it into a strainer for a while to drain, but there wasn’t much liquid left. This method seems faster and easier than trying to strain the residue out. The soy residue doesn’t taste bad, so I’m having it for breakfast with some sweetener instead of oatmeal. You say presevatives are used in gmo soy beans. What preservatives? I never heard of preservatives being used. The fact that they are dry beans means that drying has preserved them. Please cite the article or site that says preservatives are used so I can see which ones. Also, boiling removes trypsin the enzyme that impedes digestion. Soaked beans don’t have to be babied and if trypsin is released by abusing your beans, boiling will remove it. You will definitely need more than 2 cups of water to soak two cups of beans. The beans can be boiled first which is how I do it as suggested by Dr. Ben Kim. Beans are only boiled for 15 minutes to get rid of the trypsin and preserve the nutritional content. Can you explain what you said about organic soy beans not necessarily being non-GMO ? From what I know GMO food cannot be classified as organic. Can you clarify ? 1. “Certified organic” food must be non-GMO. 2. “Organic” food does not, but must have been grown without the use of chemicals. I do not have a scale and would like to try your recipe and I could not find this info on the Internet. Can you tell me approximately how many cups of soya beans is 1.5 ibs? I do not have a scale. Perhaps that information can be added to your article for those of us who don’t have a scale. Thanks! I have purchased a soybean maker. It grinds the pulp so fine that I drink together with the milk. The traditional way of making soy bean milk is to filter out the pulp. I don’t know whether it is good to take in too much pulp. Anyone has any comment about this? I think the pulp is fine. Soy beans are beans so should be OK. I am so satisfied with the information on preparing soy milk just that, I WOULD LIKE TO KNOW WHAT SIMPLE OR NATURAL PRESERVATIVE CAN BE USED TO KEEP SOY MILK FOR AT LEAST SIX MONTHS. Sorry Ivan but I don’t really know. Sterilise it (100 degC should do it) , seal it and it will keep for 2 years :-) . Don’t know if the taste and nutrients will be retain. Thanks for the recipe, but if you could give the measures in English measurements it would be a great help. I thought quarts were some sort of precious stone. Great website. Hi Bee, I am looking for a good blender but in a more affordable price range. Do you have anything in mind? I think most blenders are about the same. Can you get Shark brand? I loved it very much and I have purchased 3 from Amazon and 4 from Kinokuniya Singapore. All 3 of my Swede’s sis in laws likes it too. I am so happy I randomly found you on Amazon. Keep up your fantastic work! ! Dr. Mercola spelled out the dangers of consuming unfermented soy products. You may also want to google on “High intake of tofu linked to memory loss later in life”. Hey, may I know the ingredients for soy milk? Check the recipe on page 2.
may i know where to buy a Blendtec blender in Malaysia? I will try out the recipe but is a little concerned that simmering the milk for 30 – 45 mins will destroy the enzymes and flavanoids in it. Im looking to buy some organic soy beans and I know in other comments you said the link to the type of soybeans you use was in the post but I still didn’t see it. This is a very good article, i wsnt to know, which are the best type of soy beans that can be used for higher yields? The soy milk needs to be cooked for about ten minutes only. When you blend the soy beans, blend them with the amount of water to produce the desired thickness so you don’t have to simmer it for an hour to make it thicker. It should be at the desired thickness *before* you start cooking. After filtering the soybeans, you have the “lees” or “okara” left over. This is a very healthy fiber and protein rich food! Don’t throw it away! I use it in everything from home made bread to soups and omelets. You can dry it and use it as a very healthy soy protein additive. 1) Do NOT buy cheap bulk soybeans! They produce poorly. Most American soy bean growers grow soy beans designed for being turned into soy oil and livestock food. These will not give good results. Find an Asian market and buy soybeans grown for making tofu, you will get much better yields. There are growers in California that grow good Japanese or Asian soybeans, or you can just buy imported soy beans. 2) Soymilk MUST be cooked for at least seven minutes to destroy enzymes that are toxic. I cook mine for ten. 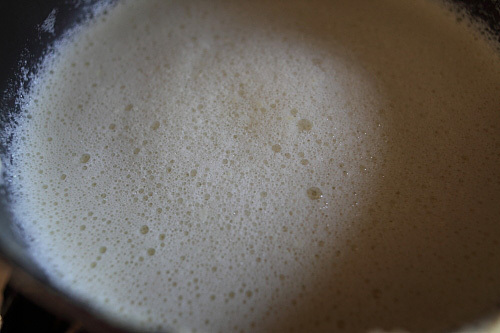 It is NEVER necessary to cook soymilk more than ten minutes. Get your soybean/water ratio right from the start. NEVER simmer soy milk to thicken it. 3) Buy a good book on tofu and soy milk making. A lot of the online recipes are WRONG. The old Japanese Tofu masters make tofu from soymilk that was made from approximately 8 cups of water to 1 cup of beans. I use that same ratio and I get perfect tofu. If you are just making it for the soy milk, you use less water depending on how rich you want your soy milk, usually 4-6 cups water per cup of soy beans. Again – go buy a good book on soy milk and tofu making.